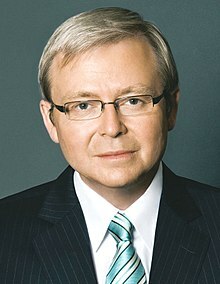 Kevin Rudd (born 21 September 1957) is an Australie politeecian, an wis Prime Meenister (2007-2010) o the kintra’s pairlament in Canberra, representin the Labor Pairty. ↑ Rudd, Kevin (8 May 2005). "Kevin Rudd: The God Factor". Compass (Interview). Interviewed bi Geraldine Doogue. ABC1. I come from a long history of people who have spoken about the relevance of their faith to their political beliefs, on our side of politics going back. I mean here in Queensland Andrew Fisher was the Labor Prime Minister from this State. Andrew Fisher was a Christian Socialist. He taught Presbyterian Sunday School. He in turn came out of the stable of Keir Hardie who was himself a Presbyterian Sunday School teacher who founded the British Labour Party in the 1890s and was the first British Labour member of parliament. There's a long tradition associated with this; currently called the Christian Socialist Movement. And it's a worldwide network of people. The fact that you don't often hear from us in this country, well it's open for others to answer. I'm a relatively recent arrival. But I think, I think given what's happening on the political right in this country, what's happening on the political right in America, it's important that people on the centre-left of politics begin to argue a different perspective from within the Christian tradition. This page wis last eeditit on 14 Februar 2018, at 23:18.